We know your wedding day and engagement means a lot to you - and it means exactly the same to us. At Klick Photography, we have a passion for beautiful images, a great sense of style and elegance and a very down to earth approach. Capturing moments and immortalising memories which tell your story is something we are incredibly passionate about. Above all, our goal is to provide you with images you'll treasure for a lifetime and which you’ll be proud to display on your wall - whether that wall is at home or on Facebook! We want you to relax during your special day, knowing that your Wedding Photography is safe hands and everything is taken care of. We think ahead, anticipate what's coming, help you plan the day and throughout much of the day, you won’t even know we were there taking shots. Our packages are tailored to cater for individual needs or budgets. Are you looking to have your wedding away from home? Having travelled to well over 40 countries around the world, we are incredibly fortunate to have experienced many different cultures and destinations. All of this experience is brought to you for free when you 'engage' us to come with you to make your destination wedding photos perfect. We understand how to get the best out of some of the most unique locations the world has to offer. Going the extra mile for us is not related to travel, it's all about working tirelessly with you and behind the scenes to ensure we get the best out of every moment. When we are with you at the location, we offer you unlimited time and coverage. We'll be planning your big day (or days) with you well before you even step on the plane - so nothing is left to chance once we arrive and we are ready to start capturing your special memories. We're happy to work out the costs with you but essentially, all you'll need to do is provide travel and accommodation and select your package above. Contact us here to discuss any questions or requirements you might have. Many couples have asked us if we can offer an Engagement Shoot as an option and the answer of course is yes! At an engagement shoot, we'll spend some relaxing time together in a location of your choice - although we might have some nice suggestions if you can't think of anywhere. If you've never done it before, we'll help you get used to the idea of 'posing' for a shot and we'll be regularly showing you the back of the camera so you can get a feel for the images we are creating together. Quite often, couples will choose to have one of the shots enlarged to show off at their reception entrance. We like the idea and from some of the feedback from the guests that we have seen, they obviously do too. Please contact us here for bookings or to discuss all your wedding day requirements. * All of the above packages are for weddings based in the general area of Sydney. Yes, we're based in Sydney but we travel regularly so we're sure you'll find that no assignment is too much of a challenge for us. Generally, if your wedding is based in another area of Australia or in an overseas location, we'll simply discuss travel and accommodation requirements. Yes, we have some contacts that can help make your Special Day that little bit more perfect. 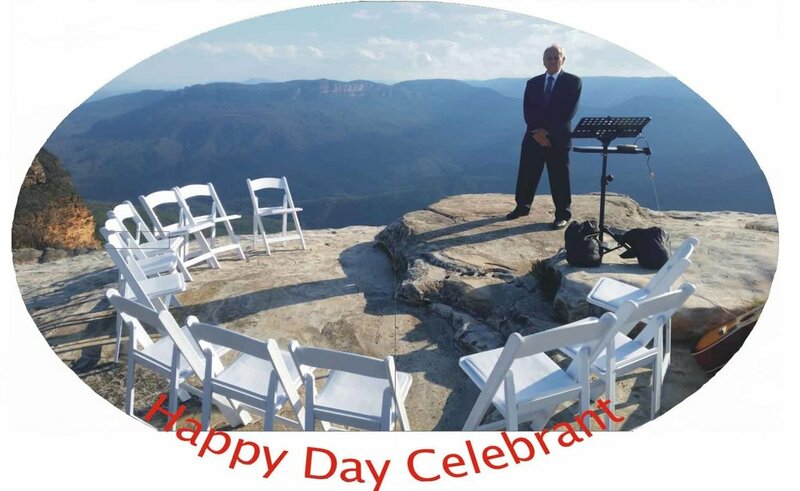 One that we particularly recommend is Phil Timbrell at Happy Day Celebrant. We’ve known Phil for many years and besides being meticulous in his preparation and delivery, he has a great sense of humour to keep you smiling throughout your special day. You can find his web site by clicking HERE or on the image. There are professionals and then there’s Emily Barnes at Emily Jean Events. Emily works tirelessly in making your Wedding Planning process the best possible experience for everyone involved. She takes care of all the small, tedious details and arrangements so you can focus on the more important stuff. She is one of those people who cares and will go that extra mile to understand all your exact needs and to make sure your wedding will not only run smoothly but will be a total success. Check out Emily’s web site either by clicking HERE or on the image.